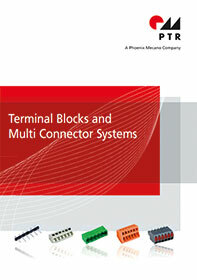 From PTR comes this compendium of the company’s extensive range of terminal blocks and multi-connector systems; the latter comprise a pin strip which is mounted onto a PCB as well as a terminal block designed to plug into the strip. Available with screw or spring terminals, the parts can be supplied in a variety of colours and terminal spacings, for metric and imperial standards. This 311-page catalogue contains electrical and mechanical data for every part in the range, as well as descriptions of the various supply options and soldering specifications.